Reservations made online can be made for up to two weeks in advance. For reservations occurring more than two weeks in advance, please contact MRC staff via email at mrc@unc.edu. Equipment must be picked up by the person who made the reservation. The MRC currently has a variety of equipment available for checkout to current UNC students, faculty, and staff. All equipment is available to checkout for 2 days (over 2 nights). Please see Equipment Loan Policies for more information. The is a video camera that can shoot AVCHD footage or 4k MP4 footage. 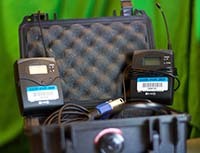 It is compatible with any of the mics we check out, and with Adobe Premiere CC in our Digital Media Lab. Included: SD card, battery, charger, tripod. The Zoom H4 Handy Digital Recorder is ideal for recording live musical performances, interviews, podcasts, meetings, classes, and seminars. The H4 allows you to record 24 bit/96 kHz digital audio as well as in MP3 format with bit rates up to 320kbps. It has two XLR/1/4″ combo jacks with 48v phantom power to connect up to two external mics or line-level sources. It can be powered by the wired AC adapter or two AA batteries. Included: Recorder, AC adapter, SD Card, USB cable. Note that batteries are not included. The Azden SGM-X microphone is a shotgun mic that is especially suited for film and video location recording applications, and it can be mounted on top of and connected to any camcorder that is available at the MRC. We have a 10 x 15 foot greenscreen you can check out for chroma keying effects and color replacement. It comes with a cloth screen and a frame. Compact, lightweight LCD projectors accept video connections from DVD players, laptops or game consoles on a standard HDMI or VGA cable. Included: Power Cable, HDMI cable, VGA cable, DisplayPort to VGA adapter. 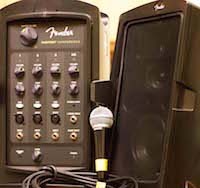 The Fender Passport Conference PA System is what you need for a public speaking event. Included: Powered mixer, two speakers, two speaker cables, one PG58 microphone, one mic cable, one 3.5mm cable, power cable.